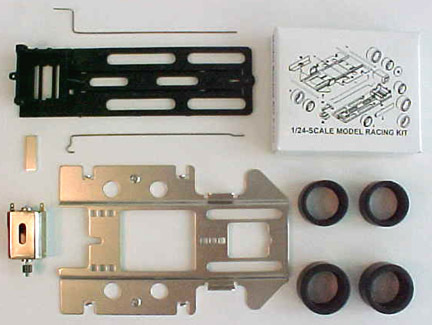 Please note that these instructions for the 1/24 scale Home-Racing kit also apply to the 1/32-scale T32004 kit as well as all Club-Racing kits. -1 small hardware bagNOTE: All new kits and RTR delivered after May 1, 2005, are fitted with a new stainless steel pin guide. Please follow these instructions for proper assembly! Tools required: one small flat screwdriver. 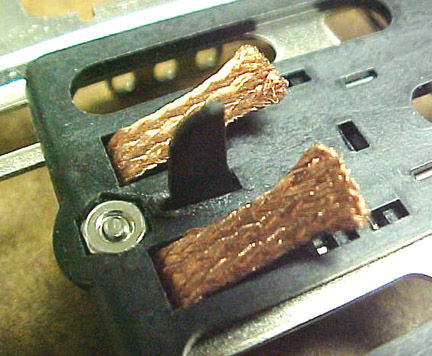 Remove any molding flash from the chassis with a sharp X-Acto knife fitted with a # 11 blade. 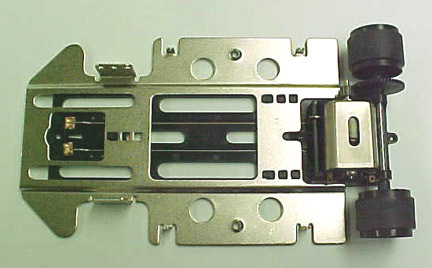 Set the chassis on a flat surface such as a piece of glass. If not absolutely flat, bend it until it rests completely flat. The material has a memory and will stay flat once this has been done. 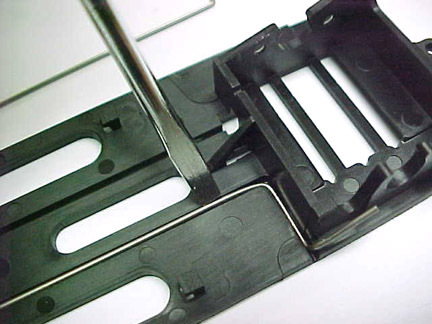 Lay the chassis on a hard flat surface and identify the contact rails as shown. For serious racing, it would be wise to bend the front end of each rail up a few degrees, to provide more positive contact with the braided brushes. 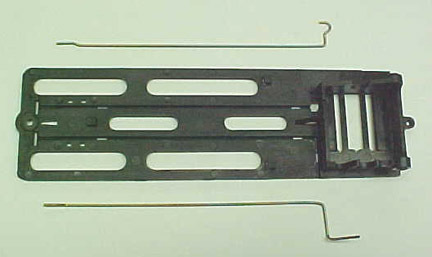 The negative contact rail is the one installed first. 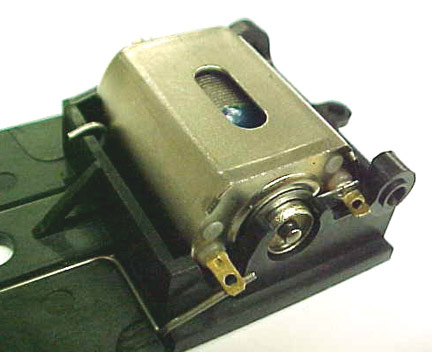 Using a small flat screwdriver, push it inside the groove parallel to the motor box first until it snaps in its location along the motor box. Push the wire in the groove as shown until it snaps in its second location..
Then into the front part of the groove until it snaps in place in its third location. Slide the positive wire through the motor box hole in this manner until the back loop rests vertically in the retaining tabs inside of the motor box. Once in its proper location, push and snap the wire in place with the small screwdriver’s blade. 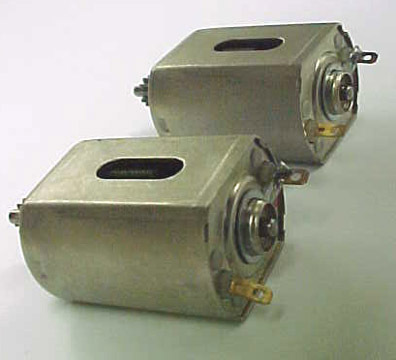 Identify the negative lead on the motor (opposite to the TSR motor sticker). The positive lead has a red dot next to it. 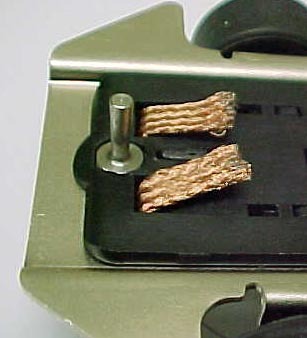 Bend the negative lead wire tab down at a 45-degree angle by lightly pushing on it as shown. 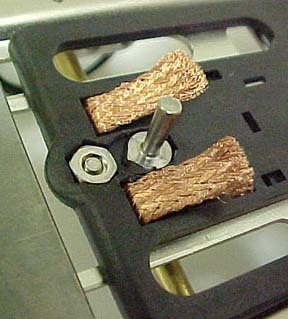 This will increase the electrical contact with the negative lead wire. Install the motor at an angle inside the motor box so as to make sure that the metal shunt around the motor bearing is inside the motor box. 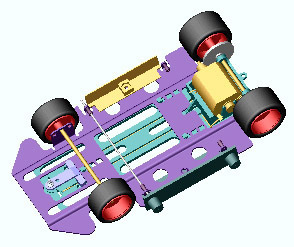 With the chassis resting on a flat surface, push the motor all the way until both ends snap in their location. Make sure the the negative lead on the motor is set ABOVE the contact wire, applying strong pressure on it.You may at this time, install the two short metric screws supplied in your kit to hold the motor in place more securely. 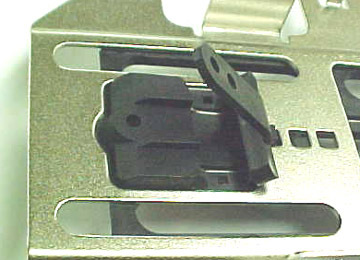 For serious racing, wrap the end of the negative terminal around the contact rail, so that a serious impact may not un-hook the terminal from the rail. 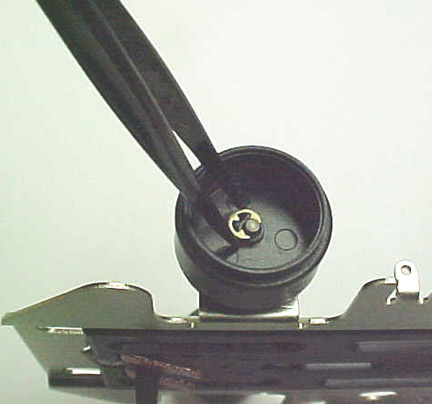 Use the flat blade of a small screwdriver and roll the terminal around the rail. Tools required: a small mallet and a flat surface such as a wood block with a small 1/8″ hole drilled in it. 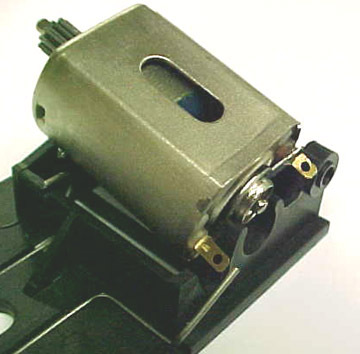 You may also use asmall hobby vise with its jaws opened just enough to clear the axle as shown below. 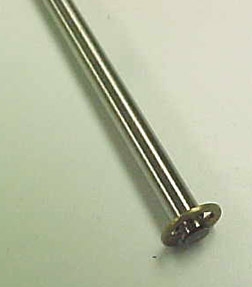 A piece of straight aluminum or brass tubing (available at any hobby shop) of 1/8″ to 1/4″ diameter. Select the rear axle (the one with no grooves in it) and the spur gear. Please note that the spur gear has a thinner boss on one side. Gently press the axle by hand on the side with the thinner boss until you feel a resistance. The spur gear as well as the wheels and the motor pinions, have an entry bore and a tighter pressure bore. This is designed so that both wheels and gears are set straight before serious pressure is encountered in the assembly process. 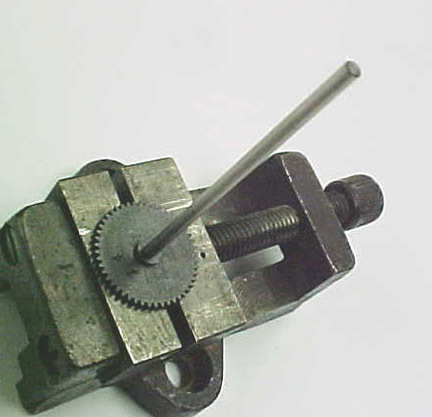 Place the spur gear over a small vise or a small block of wood with a 1/8″ hole drilled into it, then gently tap the top of the axle with a small mallet until it lightly protrudes on the other side of the spur gear. Place one rear wheel on the OPPOSITE side of the axle as shown. Push it in place by hand until you feel a resistance. Do not push the wheel all the way yet. Place the wheel on a flat surface with the axle pointing up. 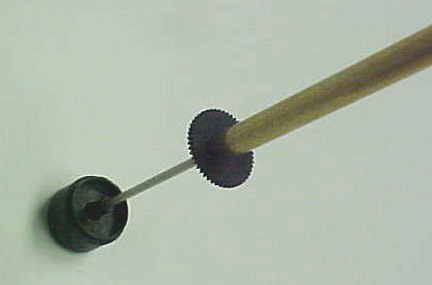 Using a piece of 1/4″ diameter brass or aluminum tubing, gently push the gear all the way down until it contacts the wheel. DO NOT USE ANY LUBRICANT on the axle for this assembly. Instructions below are for the 1/24 scale TSR chassis only: Before pressing the gear in place, it is a good idea to apply a small droplet of “Zap-a-Gap” cyanoacrylate adhesive between the wheel and spur gear bosses, so as to affix the gear to the wheel permanently. This will avoid any possible slippage of the gear if any small amount of material was removed during assembly. 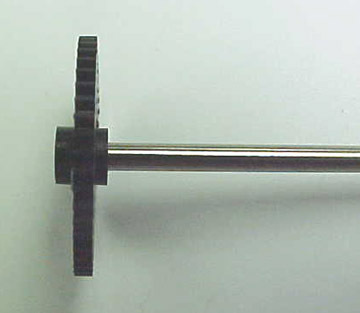 Apply a droplet on the axle where the gear will sit, then press in place as described above. Wipe any excess with a tissue and let dry. You can always remove the axle assembly as required from the offside. This procedure is NOT necessary for the 1/32 scale chassis. Place the axle through the axle bearing holes on the chassis. make sure that the axle turns freely with no resistance, then gently push it to mesh with the pinion on the motor. If the axle does not rotate freely, it only means that your motor is not properly installed. Remove it by lifting it out of its location from the pinion side, and re-install it properly. You may gently twist the axle bearings with the axle to perfectly align the assembly. Once assembled properly, it will stay that way. The axle bearing surfaces on the chassis will last many hundreds of hours of hard racing. 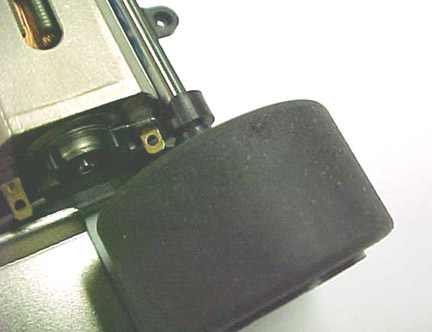 Push the left-side (offside) wheel in place on the axle until you fell a resistance. Place the right side wheel face down on a flat surface, and hold it firmly down between two fingers. 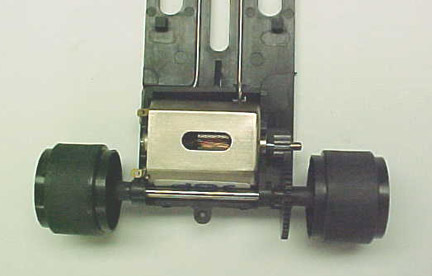 Using a small block of wood, push the left wheel all the way until it contacts the chassis as shown. Adjust the axle clearance by “unscrewing” the left side wheel while holding on the other until a very small amount of clearance is obtained, see below. For serious racing and to correctly fit wider bodies, you may add TSR wheel spacers available in two sizes. 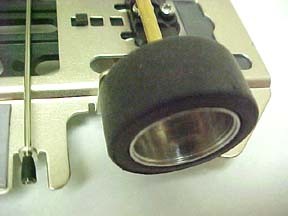 This spacer is fitted to a “Club” chassis identified by its setscrew wheel and neoprene sponge tire. Note that there is some play left in the axle. 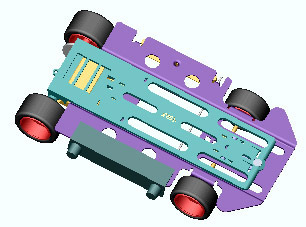 The 1/24 scale cars like about 0.5mm side play of the rear axle assembly. It makes them much more forgiving in tight corners. Tools needed: one small Phillips screwdriver. Select the braided contacts inside the small bag containing the hardware. Slide the braided contacts from the top of the chassis and bend them over the top, leaving about 3/16″ showing. This is what it should look like if you did a good job. Make sure that no strands are loose, as they could cause a short with the steel pan if left unchecked. Select the guide and push it in place. Make sure that no strands of the braided contacts are pinched under the guide’s sides. 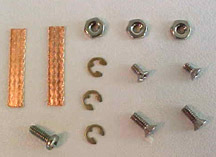 NOTE: all newer kits and RTR cars are supplied with a new metal guide pin. This may need to be shortened if used on tracks with shallow slot, such as older Scalextric “Classic” or SCX tracks. 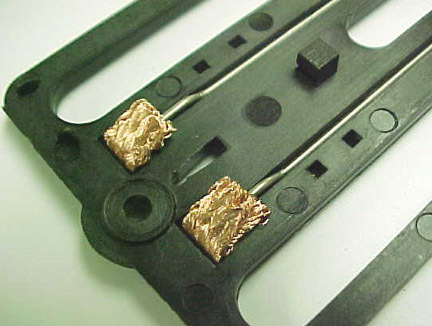 The stock pin supplied in the 1/32 cars is designed for modern plastic tracks as well as routed wood tracks. Please read installations instructions here first! 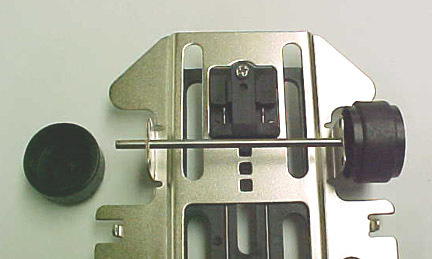 Select the guide spacer, if you are setting the steel pan in position A or B (shortest or medium wheelbase). 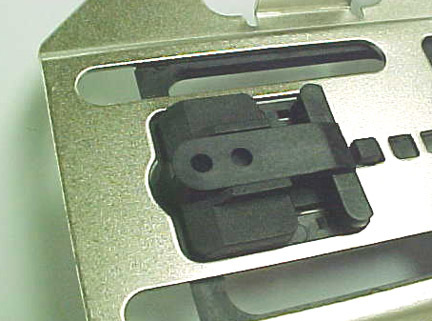 Gently push its two little hooks through the corresponding chassis holes, while holding the spacer at a 45-degree angle, until the hooks are well inside the holes. 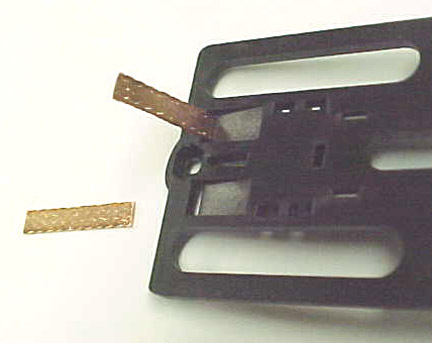 If using position C, do not use this spacer and use the small black plastic washer supplied in the kit instead. Gently rotate the spacer while still pushing down on the hooks, until the spacer rests flat on top of the guide. Verify that the steel pan is able to move lightly forward and back, and up and down. Secure with the guide screw (the one with the button head) firmly. Do not over tighten. The second hole in the guide spacer is used when the steel pan is set in position “B”. 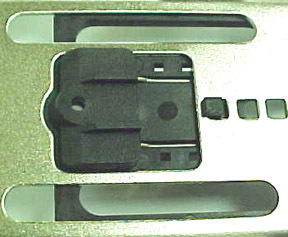 The second set of small square holes visible on the chassis are also used for position “B”. please read installations instructions about the new guide pin here first!Or follow the instructions below. 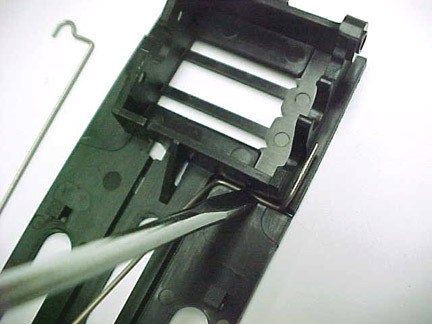 Cut the guide blade flush with the bottom of the chassis with a sharp plastic-sprue or wire cutter. Fit the new TSC25 guide pin in the front hole and install one of the 3 supplied nuts. 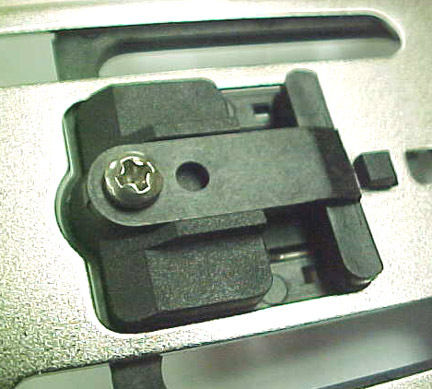 Tighten firmly with a 1/4″ socket. 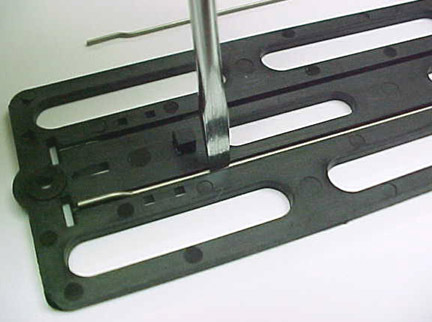 Bend the braided contacts until they are flat under the chassis as shown. It matters little if one is slightly longer than the other. 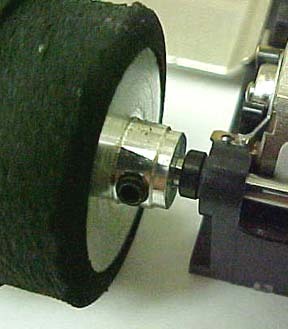 Fray the ends as shown and slightly curve the ends downwards.If using the car on a Scalextric “Classic” or Ninco track, the steel pin will need to be shortened and shaved on its sides to clear the shallower and narrower groove. Use a Dremel disk wheel to perform these operations. Or you may order the new TSC25SC pin when available. For Scalextric tracks (all), slightly pinch the braided brushes inwards to provide better contact over the narrower rails. All kits and RTR sold after 2009 include the following modification:This installation is better (but not essential) to keep optimum contact during on-track drifting, especially when not using traction magnets, to mount the pin in the center of the braided contacts. This requires that the chassis be drilled and gently counter drilled to provide clearance for the pin’s center hex. Install the original guide blade first and trim the blade as described above. Precisely drill a .086″ hole (drill # 44) and countersink with a flat 1/4″ drill. Ideally, a step drill should be used, and it is critical to drill only 1/16″. Be careful not to drill any deeper as you would drill through the chassis as this would be terminal…Customers who have purchased a kit not upgraded with this modification and who do not believe that they have the necessary skills to perform this delicate surgery can exchange their chassis for an upgraded model. Contact TSR for instructions about this exchange. 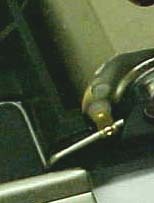 Select one E-clip and install at the end of the front axle (the one with the grooves at its ends). Make sure that it is pushed in all the way (it should be able to rotate around the axle). Install one front wheel, and slide the axle in place in the axle hole selected to fit the body. Place the other front wheel. Using the tweezers or the Rotor Clip applicator, install the second E-clip until firmly in place. The Rotor Clip E-clip applicator will soon to be available directly from the TSR website. DO NOT USE SMALLER TIRES on front of the car than the ones supplied in the kit under any circumstances. They keep your braided contacts from wearing and insure a very long contacts life. Install the FLAT part of the front tire on the outside of the wheel. For serious racing, glue the tires over the rims with Tamiya tire glue. Make sure that the tires are perfectly installed and run true before letting the glue dry. Now install the rear tires, with the injection point on one side of the tire’s thread pointing to the inside of the car. Make sure that they are properly and completely set in place. NOTE: NEW HIGH PERFORMANCE TIRES ARE NOW AVAILABLE! Check the spare parts catalogue for the new TSR-Ortmann tires.We strongly recommend their use over plastic or wood tracks when no traction magnets are used. 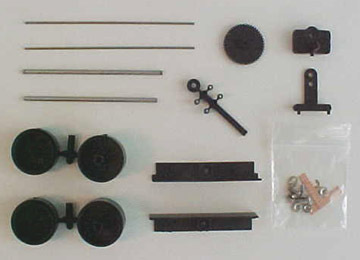 body-mounting instructions page.This 1/24 scale T24002 chassis is shown with the pin-tubing installed to mount the body with 4 straight pins. 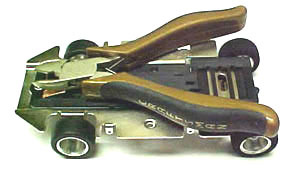 This 1/32-scale T32004 chassis was assembled with the two plastic side body mounts bolted to the steel pan. Double-sticky tape, epoxy or Velcro will now be used to mount the body. Extra body mounts are available. 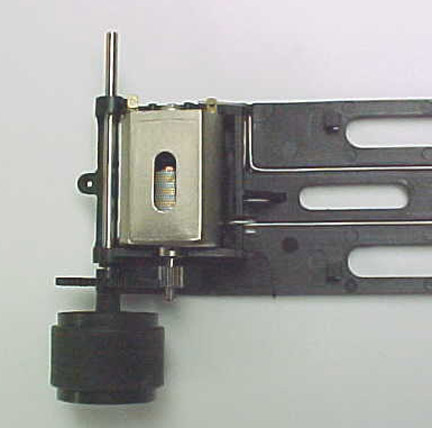 If using the pin-tubing body mounts, we recommend the use of the TSR Automatic Body-Mounting Tool shown above in darker blue. This tool is used with a pin vise and a small twist drill and allows the perfect mounting of injected plastic bodies with great precision.